Lumbarda is a small town situated on the eastern cape of the island Korcula. It is unique for its untouched picturesque scenery, rugged coastline and crystal clear sea that surrounds the sandy beaches which are rare in the Adriatic; the rich history preserved in documents dated more than two millennia; near the beautiful town of Korčula; shady olive groves; great varieties of wine grapes which fails elsewhere; preserved folk customs, culinary specialties of local cuisine. . . But most of all – its kind hosts. In the past Lumbarda was the main Korčula bishops and nobles destination, and still exudes a country-style atmosphere. 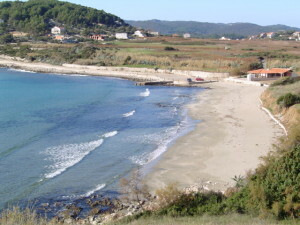 Situated along the bay and the sea on the slopes of the hills which surround the valley which is dominated by vineyards. 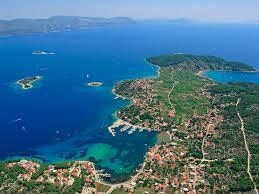 It can be accessed from six kilometers away Korcula road that passes through the olive groves and pinewoods. It counts 1200 inhabitants who have for centuries engaged in viticulture, fishing and stone-masonry. Today are hosts for many guests seeking a quiet, safe and special holidays. Sandy beaches and an archipelago consisting of twenty small islands attracts swimmers . The landscape is filled with scents of Mediterranean herbs, pines and salt, and color palette is dominating by the color of the sea from turquoise to dark blue, white sand and stone, green pines and agaves silver – green color. Above the knock of seagulls and the waves under the breeze, pours warm sunshine that drunks the spirit and body. It attracts gourmets by local specialties prepared from fresh sea & garden foodstuff. Wine connoisseurs come to Lumbarda from afar to taste Grk white wine made ​​from indigenous grape varieties of the same name. About our customs, dances, songs, crafts, artists, food and wine we introduce our guests throughout “Lumbarajska Fiesta”; a combination of performances and events in the evenings ours which makes Lumbarda memorable.